It was 2002 in Austin, Texas when a young woman had an idea and a drive to see it come to life. Kendra Scott, a Texas transplant by way of Wisconsin, took $500 and designed and hand created her first jewelry collection. She worked out of a spare bedroom in her home, just down the hall from her then infant son. She then hoofed it to boutiques around the city famous for Keeping it Weird. By the end of her trip, she was forced to sell every single one of her samples to her last stop in order to raise enough capital just to fill the orders she had collected that day. Needless to say, her designs were a hit then. A mere three years later, her collection was chosen to accessorize Oscar de la Renta’s 2006 Spring Runway collection. By 2010 Kendra had opened her first storefront and launched her e-commerce platform online. Today her company is valued at over $1 billion, USD. What started as a series of necklaces, their forms now absolutely iconic in the modern fashion industry has expanded drastically. It now includes everything from home decor to nail lacquer. Beyond a fierce entrepreneur and a design maven, Kendra Scott identifies herself as a philanthropist. She puts her money where her mouth is as well. Kendra is well known for her charitable giving, both personally and with the long, wealthy reach of her company. Generally, she tends to support charities that provide aid and support to women and children although that is not an exclusive trend in her giving. We love Kendra Scott. We love her jewelry more. So much so that we have located ten of our favorite Kendra Scott necklaces we could not wait to share with you. One of the first stones Kendra was inspired to work with was mother of pearl. Created from abalone shell, the iridescent stone is often relegated to “lesser” works and has not always been deemed valuable or desirable. Nevertheless, Kendra saw the beauty of the the white stone with swirls of color swishing across the surface like an oil slick. Her treatment of it here is beyond perfect. The facet cut mother of pearl is arrayed by a sunburst of rose gold and crystal. Fingers of rose gold grasp the mother of pearl stone. Cubic zirconia accents jut out like sunbeams. It feels very art-deco to us. Pair this piece with any number of outfits to great effect. Given the very 1920s vibe it gives off, we love this with a little black dress number and some white pumps. You can use this piece to channel your inner Great Gatsby feels. The warm rose gold will stun over black or maroon for an evening look. Alternatively, this will translate very well to a bohemian free spirit aesthetic as well. A high neck button-up blouse with a subtle print paired with a bold colored pant and long lace vest will really make this Kendra Scott piece sing. Choose a cooler palette for this look and it will warm right up with the trendy rose gold and flashes of glittering white stones. 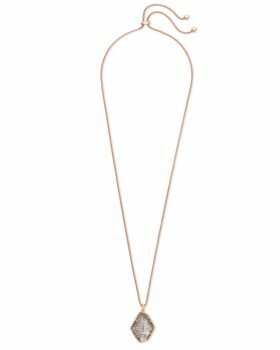 Kendra Scott’s signature piece is this elongated hexagonal stationary pendent. It is available in a wide range of stones and finishes and each one is just a perfect as the one before it. 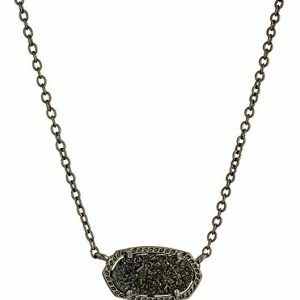 We, however, adore this edgier one in black drusy and gunmetal. Druse is another one of Kendra’s tricks of the trade to get beautiful gems into the hands of women everywhere. To avoid the hefty price tag she sources unique varieties of semi-precious stone. She also enjoys highlighting materials that are otherwise snubbed by fine jewelry makers. Druse is among them. Also known as druze or drusy, druse is a stone that has been coated in a fine crystalline structure. Much like the inside of a geode, these rock formations are wildly common but not often featured in jewelry. Most importantly, not only are quite common in nature, they are easily created in the lab. Under the right conditions, crystals can literally be grown. Drusy offers all the sparkle, shine, and color of fine gems without the price tag. In this case, it comes in a glittering onyx black. This is the perfect complement to the 14k gold over brass with a gunmetal finish. It arrives on a petite fifteen-inch chain with a two-inch extender so it will wear close to the collarbone. We love this piece to add some edge to your best business wear. It is darker so it will stand out against a paler blouse but not so ostentatious as to be distracting. 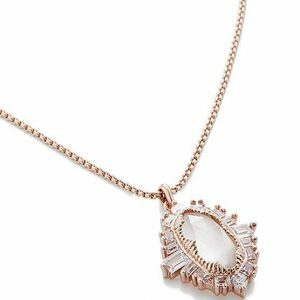 While Kendra Scott loves her stones, her classic creation of the Aiden pendant proves she knows her stuff when it comes to metalwork as well. The stylized teardrop shape contains no stone but shows that skilled designers can make anything work. This piece, in particular, seizes on a recent rise in popularity for mixing gold colors. Throughout the eighties and nineties, mixing gold was a fashion no-no. Luckily we have a bit more freedom in today’s fashion landscape. The rose and yellow gold tones blend seamlessly and effortlessly. The filigree work is created in the coppery rose gold while the detailed, rolled edge clings on in a sunny yellow gold. The necklace is done in 14k gold and arrives on a hefty thirty-two-inch chain with an extender. This makes it the perfect candidate for an elegant layered look. Use this Kendra Scott pieces as the anchor, or lowest piece. Pair it with a mid-length rose god piece with subtle pendants if any. Finally, cap the look off with a yellow gold piece featuring the gem of your choice in the sixteen or seventeen-inch range. We love a good gold and pearl piece but that is up to you. If you really wanted to push this over the top, pick a second Kendra Scott piece for the uppermost necklace. Really spread the designer some love with your look. Another one of Kendra’s stone picks oft ignored by other jewelers, sable mica is a material used almost exclusively by Kendra Scott. It is routinely ignored by the jewelry industry as it is considered to fragile for use. While it is highly wearable and durable, it can be difficult to cut into predictable shapes. Formed in thin layers of silicate, the coffee-colored stone plays with light wonderfully. But since it is a layered formation, cutting the stone to facet it “properly” often results in chipping or flaking for the surface. Not willing to entertain such waste, most jewelry designers shy away from mica. Not Kendra Scott, of course. She resolves this flaking issue by simply not faceting it according to the “rules”. Her Kalani pendant is an irregular polygon. This allows for more grace in handling the otherwise fragile and finicky stone. Plus it gives the wearer a very unique and beautiful stone unlikely to be featured in other designs. Everyone can wear a diamond and we love those very much. But true jewelry aficionados also seek out the uncommon and unique. Kendra Scott’s application of mica to rose gold definitely counts. 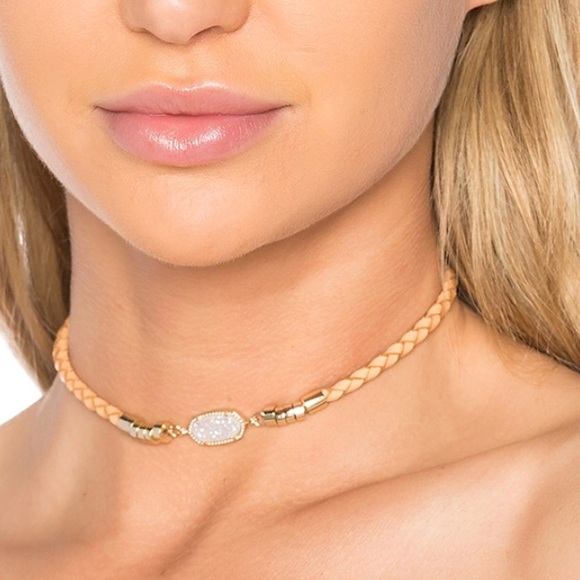 This necklace is perfect for a casual look. The rich brown tones add a classiness to even the most dressed-down, coffee date look. Plus we love the synchronicity of matching our stone color to our activity. Coffee colored stones for a coffee date just sounds so wonderfully delicious. Next up is another nod to geology from our Kendra. Rose gold and warm copper-toned crystals join together in what, at first glance, seems to be a hodge-podge of arrangement. It is actually meant to remind the viewer of natural crystal formations. Often crystals grow in clusters with odd angles and protrusions. These are too often cut away to get to the good stuff, and rightly so. If you want a quality amethyst piece, you have to sacrifice some of the smaller bits to get to the big one. Even Kendra Scott does so with some of her other creations. However, this necklace pays homage to those irregular but comforting patterns of nature. Square, oblong, and round crystal are snugged up tight, encased in a delightfully chipper rose gold. It arrives on a sixteen-inch chain with the two-inch extender. This makes it perfect for adding to just about any outfit. We really see this piece working it as part of a complementary pop in a monotone outfit. Try it with a Kylie Jenner-esque all denim number. If you are braver than we are, pull out those ivory pants and that ivory shell that you are constantly afraid of staining and pair it with this necklace. The dainty necklace might not be much of a statement on its own but paired with the right outfit, it can definitely deliver the knockout punch. 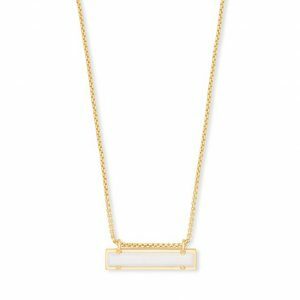 Kendra Scott’s take on the trend gives you fifty whole inches of chain to play with. Available in yellow gold, rhodium silver, rose gold, or gunmetal, each is capped off with this adorable tasseled finials. Wear it looped around the neck a few times with the tassels hanging down over each shoulder. Flip it around to leave the tail down your spine with a low-slung backed top. Tie it in a loose knot for a long addition to a layered look. Even pair it with a brooch for a faux bolo style necklace. The possibilities are nearly endless and we love it with everything that is in us. This long tasseled pendant by Kendra Scott combines art and science perfectly. A navy blue stone is polished and cut in such a way that a band of light slices through the center of it. It is reminiscent of a cat’s eye with the narrow, slit-like pupil. Known as chatoyancy, it is a brilliant application of science to jewelry making. It is another example of Kendra maintaining a firm understanding of how to make otherwise inexpensive materials look positively lush. 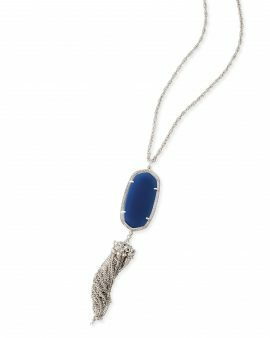 Framed in rhodium silver, a long tassel of chain is suspended beneath the brilliant blue cabochon. It comes on a lengthy thirty-inch chain. Typically we are all about the layered life with long pieces like this one. But in this case, we think solo will do this necklace the most justice. Pair it with other shades of blue and denim for a monochrome look. Or pop it over a complementary color like a bright orange to have it stand out. 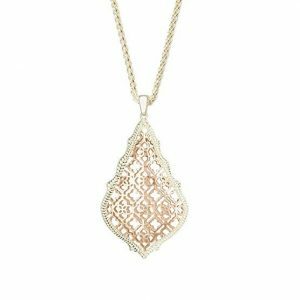 Yet another marriage of jewelry-making and science, we revisit Kendra Scott’s Kalani pendant with our next selection. This particular iteration features a dichroic glass in a shimmering amethyst tone. Dichroic glass is made when a specially designed filament is sealed by flame between two pieces of glass. It allows for a stunning play of light that gives a luminescent color shift. It is almost iridescent as the color shifts from blues to purples depending on how it is viewed. 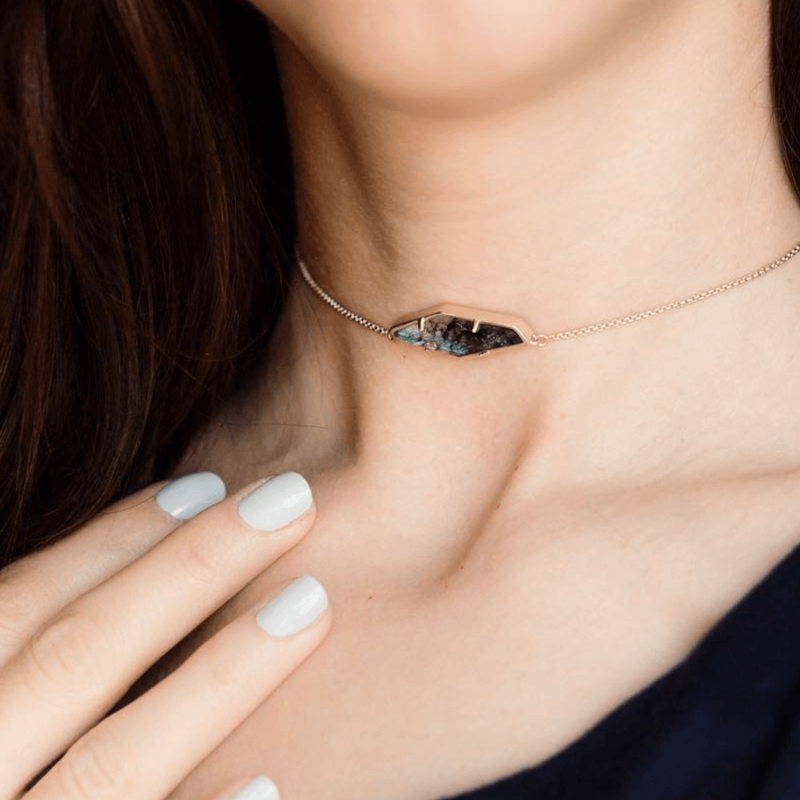 Paired with the irregular polygon of the Kalani pendant design, this necklace is simply mesmerizing. We love this to be paired with paler tones in the cooler palettes. 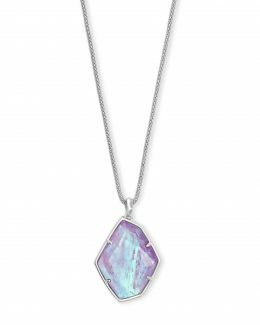 Pastel purples, subtle periwinkles, and seafoam greens are sure to make this necklace really shine. Plus the dichroic glass light play will work wonderfully with all those color suggestions. This necklace comes on a thirty-two-inch chain so it will hang mid-torso against your blouse. We strongly recommend pairing it with, at the very least, a solid tone so the necklace will be the star of the ensemble. Kendra returned to her stone-selecting roots with the Leanor design. A bar of mother of pearl is enshrined by a casement of yellow gold and hung from a sixteen-inch chain. While it is not the simplest of our Kendra Scott selections, it is still understated in its elegance and charm. The design works with the recent trend in bar jewelry. While most simple bars often feature a birthstone or engraving, this work is simply mother of pearl and gold. It is a match made in heaven. 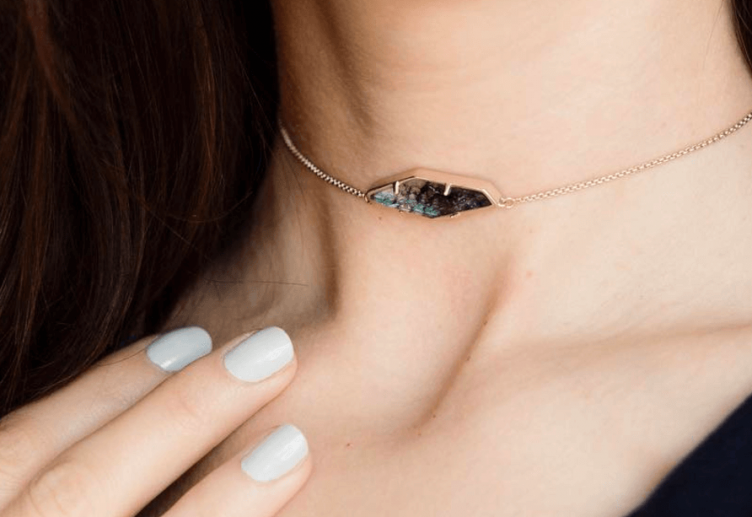 The necklace will hang right at the collarbone for most people if worn without the optional two-inch extender. Almost a choker length, this is the perfect positioning for this piece. It is a wonderful selection for a subdued layered look as well. Additionally, we know this to be an easy piece to transition from business wear to daily wear to evening wear without losing a step. The easy refinement of the design makes it wearable with literally everything. Finally, we offer this classic Kendra Scott piece, also in mother of pearl. We know we should vary those stones up for the purposes of our list, but when a designer knows how to handle a stone, we cannot resist showing it some love. 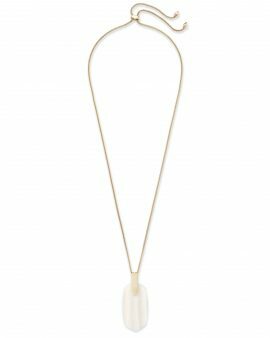 This long pendant is a simple textured piece of mother of pearl hung from a delicate gold bail. A long gold chain in the thirty-inch range is included. This piece is as elegant as the rest. Our favorite part is the gentle wave cut into the mother of pearl. Wear this piece solo and it is perfect for the boardroom. We also love it to class up an otherwise understated outfit. It can add a touch of finesse to a flannel and leggings just as easily as it can add a bit of whimsy to your power suit. She was born in Kenosha, Wisconsin, the daughter of a county lawyer and a Mary Kay lady. While they were by no means in the rags category, Kendra is quick to point out they were not exactly one percenters either. “I wasn’t born with a silver spoon in my mouth,” she says. Her biggest inspiration and push to the fashion industry had been the influence of her aunt. A fashion director and the then powerhouse retailer, Gimble’s, Scott’s aunt had some power, both in the fashion industry and over her impressionable niece. Scott recalls her education at the hands of her aunt as magical, eye-opening, and something that truly influenced the rest of her life. The 70s and 80s were a different time in the fashion industry. A fashion director and a savvy one at that had the power to drastically alter the entire look of a city. At a time before the power of the internet and Instagram, fashion directors from every region traveled to Paris to pour over the couture looks. They would select their favorites for their region and return home, high-fashion purchases in hand. These high-end looks would then be edited and pared down into approachable looks for the everyday woman. It was in this culture of transformation and fashion that Kendra Scott first found her passion. At the age of 18, she had been enrolled in college at Texas A&M but dropped out the next year, following a boyfriend to Austin, Texas. While the plan had been to resume her enrollment deep in the heart of Texas, that plan never materialized. Instead, she tip-toed her way into fashion, beginning first in the retail side. Her jewelry designs were not her first foray into fashion nor design. Kendra opened and ran a company called the Hat Box. She had watched her step-father battle brain cancer and began making and selling hats. Drawing on the inspiration of her aunt’s education and her step-father’s experience, she made a rather valid attempt at reviving the art of millinery. For nearly ten years she toiled at hats and handbags, even trying her hand at an early version of e-commerce. This was long before the rise of the dot-coms and the utter dominance of online buying, of course. It was rough going. Unfortunately, she ended up shuttering The Hat Box, but it was enough. The bug of the fashion industry had bitten her long ago and the venom was taking hold. She decided to look at things from the opposite side of the spectrum. If retail was not her cup of tea, perhaps production would be. She had begun her earliest jewelry designs while still working on The Hat Box, but they were little more than half-imagined sketches and a tinkered trinket or two. Her big revelation in what corner of the market to tackle came in the last days of her desperate attempt to make The Hat Box successful. Always a woman of taste and style Kendra was scraping the bottom of the barrel toward the end of her first retail venture. If she was unable to afford a decent meal, certainly pleasantries like jewelry was far out of the question. She reasoned that if she still felt a pull to owning pretties and glittering bits of stones, even when strapped for cash, she could not be alone. Certainly, other women longed to adorn themselves without paying the high-end premiums associated with fine jewelry. “I couldn’t afford a pair of $300 earrings in rose quartz. I realized that if there was a way I could design beautiful, handcrafted jewelry at an affordable price, I could fill a white space in the market.” Kendra Scott said in a 2016 interview. Thus her greatest idea, and ultimately, success was born. Her chunky pieces of stone necklaces and glittering examples of economically sourced materials are widely popular. The line, to this day, features many pieces available for under $100. Long gone are the days of pencil sketches and spare bedroom building. Her grandiose headquarters, not far from her bustling Austin storefront, features an innovative space for design to flow freely. Scott encourages her design team to reach into everything for inspiration. And she equips them with a wide range of tools to do it. A broad collection of materials, textures, shapes, and sources of inspiration is made available to them. They utilize everything from free sketching to 3D printing to ensure that they keep their designs fresh. Fashion is an ever-changing landscape and jewelry design cannot fall behind. Especially in today’s production and wearability trend of fast fashion. Giants like H&M have cornered the market in throwaway fashion. It is quickly produced, cheaply bought, and there is no guilt in moving on to the next trend. Given Kendra’s background in making fashion pieces at an affordable price, it means she keeps her designers on their toes. If clothing can be in and out in the space of a week, the jewelry must be able to float from trend to trend. It must stay relevant but flexible. That is a big ask from what is essentially creative arrangement of rocks and metals. Yet, equipped with their state of the art studio and their effervescent leader, they manage to do it. Naturally, there are the classic looks that cannot be forsaken, but Kendra Scott is not satisfied with simply relying on the basics. She has her signature styles, of course, and recognizes the importance of keeping those in her design landscape. However, she encourages her team to continue forward thinking. Scott was taught by her mentor and aunt to read the trends of high fashion as well as the daily wear of women on the street to predict trends. Kendra seems to have her finger on that pulse. Her new designs continue to stay in demand with everyone from soccer moms to red carpet debutantes. As mentioned above, Kendra Scott believes in the giving of her time, talents, and cash. Her stores offer her now famous Color Bar, including her flagship store on South Congress in Austin. People can custom design their own piece of Kendra Scott jewelry, electing everything from size to gold tone to stones. Beginning in 2016, she created a mobile version of her color bar and began taking it to children’s hospitals throughout the South and Midwest. At the time this article is published, Kendra has created and given away for free over 6500 pieces of custom jewelry to patient and parents at ten different hospitals. There is no end in sight for this work either. She still runs her Austin-based company with three core tenants: Family, Fashion, and Philanthropy. Collectively her company has given over two thousand hours of service to community and national causes. Over $10 million dollars of in-kind donations have been collected and doled out to over ten thousand different charities. $4.5 million dollars of company profits have also made their way into the hands of organizations both in Austin and nationally. Her Kendra Gives Back programs have donated and inspired millions of dollars of giving, all while running a veritable fashion empire. From a humble bedroom in Austin to the very runways of Paris that first inspired her fashion journey, Kendra Scott is a force to be reckoned with in the fashion industry.